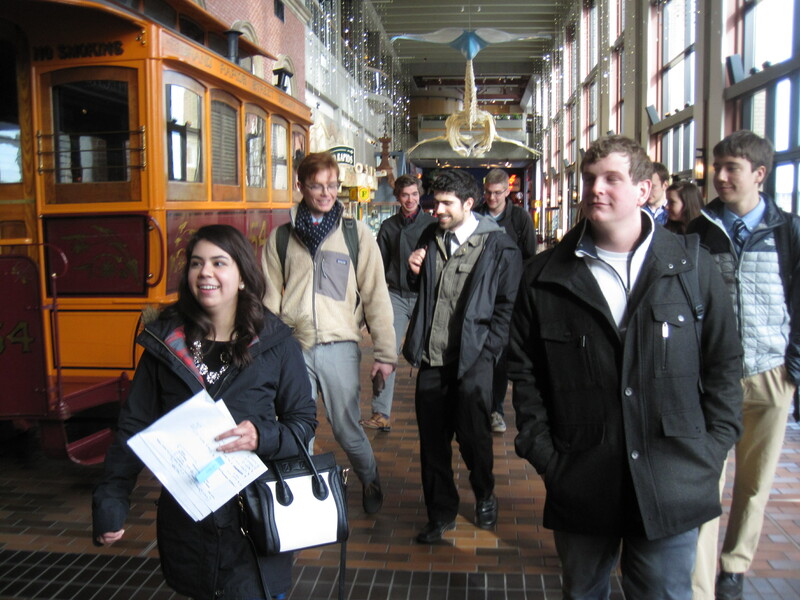 Students in the 2015 Interim class History 294 tour the Grand Rapids Public Museum. This past January, the students in my History 294 class collaborated with the Grand Rapids Public Museum in its ongoing efforts to digitize its museum collection. It was a rewarding project for the Museum, for the students, and for me as a teacher. The GRPM’s digitization project reflects a worldwide trend that in the last decade has transformed the way museums educate the public. It was great fun to learn more about that transformation while helping students to make their own small contribution to it. Museums began to digitize their collections in the 1990s. Larger museums pioneered these efforts, and still lead the way. Virtually every world-class museum now has a world-class website that allows visitors to browse, search, view, and read about its collections online. Most major museums now seem to profess the goal of complete and unrestricted electronic access to their collections. But providing that kind of access is a huge undertaking involving years of work, much of it still unfinished. North America’s largest museum, the Smithsonian Institution (actually a museum network, with over 137 million objects in nineteen separate museums) has its own Digitization Program Office, whose full-time staff digitize thousands of items per day, using high-tech cameras that resemble airport scanners. Just last month, the Freer and Sackler Galleries became the first branches of the Smithsonian, and the first Asian art museums in the world, to offer their entire collections free to the public in digital form. But this represents only a small fraction of the Smithsonian’s entire holdings. The British Museum’s online collection now boasts about 3.5 million objects, somewhat less than half the 8 million in its London collection. Screenshot from the Cuneiform Digital Library Initiative collection at Princeton. Digitization projects often combine the traditional roles of museums and archives by making textual artifacts fully viewable, readable, and searchable online. They run the gamut from ancient to modern history, and often span the globe. The Cuneiform Digital Library Initiative (launched in 1998 from Oxford, Los Angeles, and Berlin) will eventually include some half a million clay tablets, including the 30,000 from Neo-Assyrian King Ashurbanipal’s library. In 2014 Britain’s National Archives and the Imperial War Museum jointly launched Operation War Diary to transcribe and publish millions of pages of soldiers’ reports from the western front of the Great War (1914-18). These projects, even with large teams of professional scholars and technical experts, will take years to complete. Many museums have harnessed the power of volunteers in these large-scale digitization projects. Last summer the Smithsonian turned to crowdsourcing, launching a new Digital Transcription Center to seek help in transcribing thousands of newly scanned documents. Operation War Diary also solicits online volunteers to help tag and catalogue its war diaries. (If you are a history buff with time on your hands and an eye for details, take note: both projects still have plenty of work available.) Volunteers simply complete their transcription or tagging on the website anonymously, much like Wikipedia contributors. Multiple transcriptions of the same document help to minimize errors. 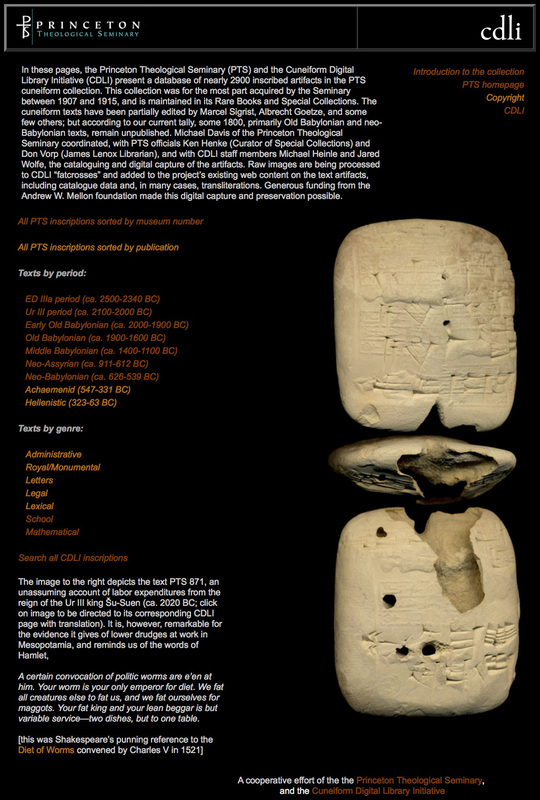 The Umm el-Jimal Project website offers a virtual museum of the site. Click the picture to explore. Digital access brings different benefits to different institutions. A website can help a small museum or historical site in a remote location to reach audiences worldwide, like Prof. Bert De Vries’s superb Umm El-Jimal Project. Or it can provide greater visibility to objects in major museum collections that sit hidden in storage; a museum like the GRPM only has space to display about 10% of its collection at a time. Curators can also use websites to provide viewers with much richer contextual information for objects than what is normally displayed in a physical exhibit—not only details about an object’s origins and original use, but information about its cultural and historical significance. The GRPM’s Collections database, created in 2007 and presently undergoing a major overhaul, aims to bring all three kinds of benefits to the museum: to expand its reputation beyond West Michigan; to showcase objects that cannot be displayed in the downtown museum; and to provide information about these objects that will be valuable to both amateur viewers and scholars. Our class’s work helped mainly to advance the third goal—to provide more historical context for the objects featured on the website, and give visitors a deeper appreciation for their historical and cultural significance. As of February 10, 2015, the online database contains 169,142 digital records, each with a brief description of the object and some basic information, such as the donor and place of origin, if known. But most of these catalogued objects have not yet been photographed. Thus only 38,000 of the digital records are yet accompanied by digital images, and less than half of these have complete records explaining fully what the objects are or offering historical or other contextual information. Since only four full-time staff members are available to research, photograph, and catalog the collection, and they also have other responsibilities, the work progresses slowly. The help of unpaid interns and other volunteers is crucial. 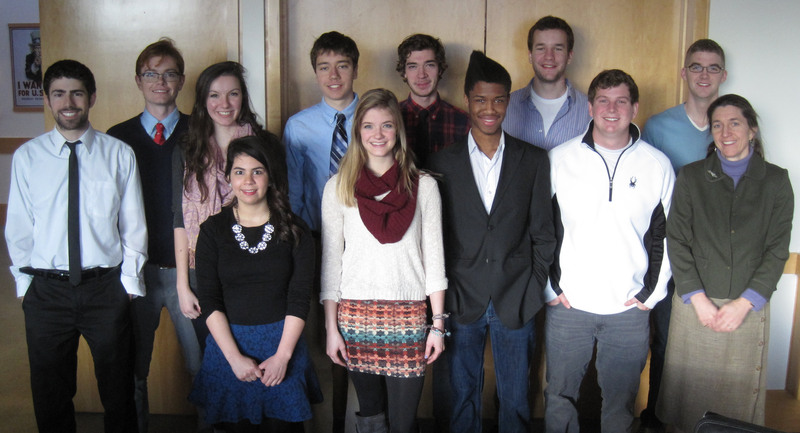 Many past Calvin students have joined in these efforts by serving as museum Collections Interns. Kate van Liere (right) with her Interim 2015 HIST 294 students. For the first assignment, five teams of students each produced a proposal for a historical museum exhibit that would include at least eight objects from the GRPM’s collection. We returned to the museum to present these proposals to GRPM’s staff on the final day of the course. The students came up with five terrific concepts: elephants and their interaction with human beings around the world; changes in timekeeping technology; how southwestern Native American cultures used turquoise and horses; propaganda in the First World War; and Grand Rapids’s Ramona Park and twentieth-century public entertainment. 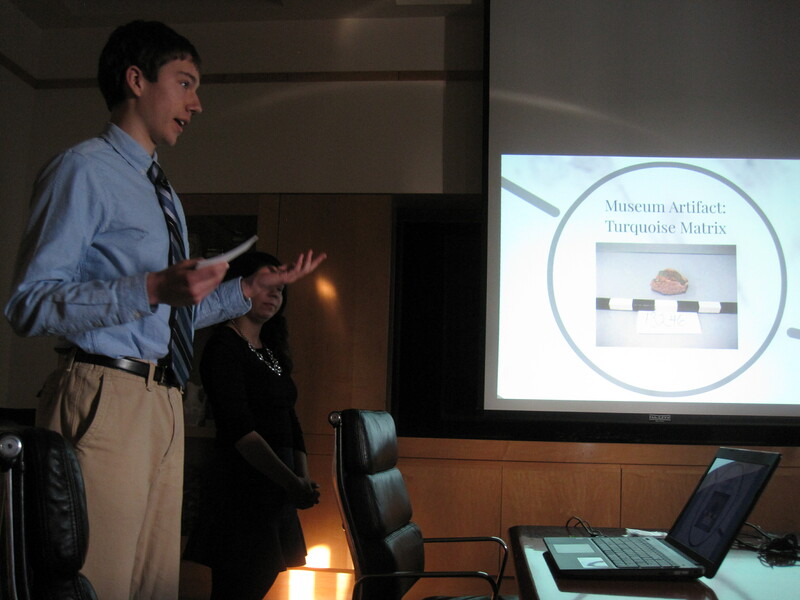 A student from the course presents his research to museum staff. Both the quality of the students’ proposals and the museum’s enthusiastic reception were gratifying. While we don’t expect the museum to mount any of these exhibits per se, our audience of curators, vice presidents, and the museum’s CEO was clearly inspired by the creative ways that Calvin students found to use artifacts to ask big questions, connect the past with the present, and construct meaningful historical contexts. Interested in working hands on at the GRPM or other local institutions? Talk to Professor Kate van Liere about the history department’s internship course. Kate van Liere is a historian of early modern Europe, with particular interests in Spain, intellectual and religious history, and historiography. She has edited a collection of essays about Christian historical writing in Renaissance Europe. She also teaches in the Spanish and Dutch departments at Calvin and co-directs Calvin’s Rhetoric Across the Curriculum program. This entry was posted in Kate van Liere and tagged Calvin College History Department, courses, Grand Rapids Public Museum, GRPM, history, History 294, museum. Bookmark the permalink.